Once upon a time George was a well known boxer, but now? He’s the last word in healthy eating gadgets. As there’s just the two of us we only needed a small one, but even that is big enough to cook 3-4 slices of bacon or up to six sausages. Those are the foods we use it for most, but just looking at the amount of fat that drains out of the bottom makes it a fabulous investment. It is also easy to clean. While it is still warm, I empty the fat tray which sits underneath, pour a drizzle of washing up liquid over the plate and then pour a small amount of boiling water over it, so that the tray will catch it. A quick wipe with a sponge and a dry with some kitchen towel does the trick for the bottom plate. For the top plate, again a wipe with a sponge soaked in hot water with a drop of washing up liquid on it should suffice and then just wipe it dry with some kitchen roll. The fat tray can be done with your washing up and it is even dishwasher safe. 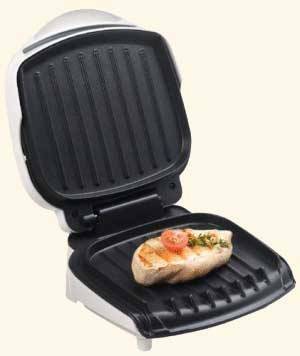 Our Foreman Grill cost us about £15 and was a brilliant buy. If you like to grill things like chicken and steaks as well as sausages and bacon, this is absolutely worth your while! Especially if you are trying to cut down on fat and convert to a healthier lifestyle foodwise. This entry was posted in Busy Life Recipes, Updates and tagged Bacon, Busy Life Recipes, George Foreman Grill, Healthy Eating, kitchen gadget, Sausages.